Heating and Cooling Units – Here at Flexiheat UK we produce two ranges of heating and cooling systems,that are ceiling mounted heating and cooling units, we have developed a high reliability, high specification heating and cooling unit which produces a higher thermal output, be it warm air or cold air, at a given air volume and noise level.These individual heating and cooling units are the perfect solution – from small heating and cooling units to large, and we are confident we can satisfy your site requirements from withing our range. They are sturdy, compact and versatile units that are suitable for such applications as retail outlets,workshops,garages,and warehouses. Service and production areas etc. 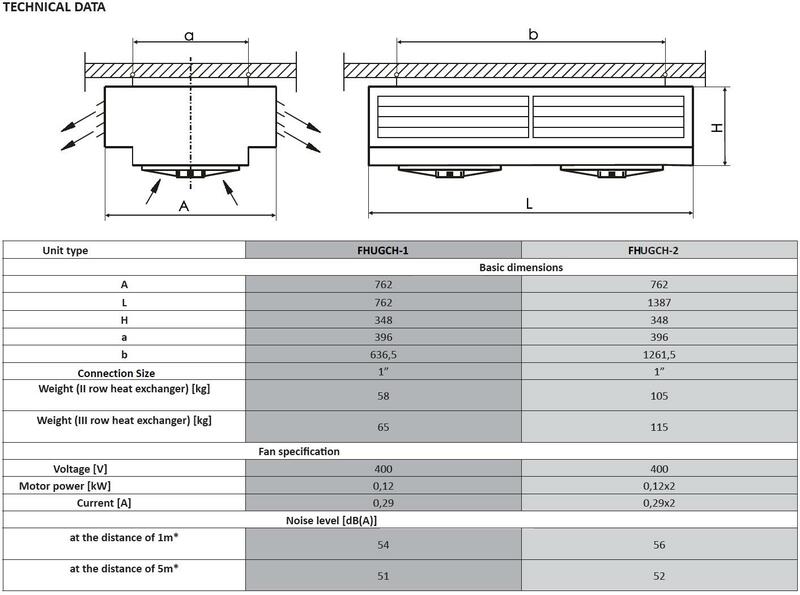 BRAVA 2 heating units with cooling option are intended for installation under ceilings, and extends the range of heating and cooling devices produced by Flexiheat UK. 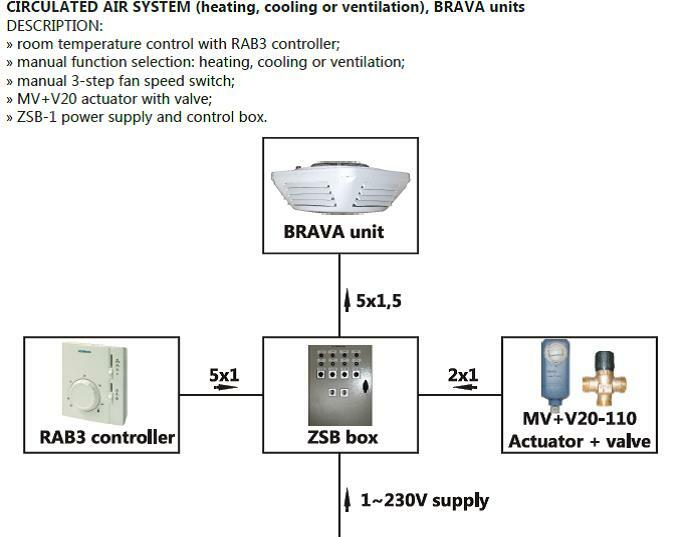 At special request we can supply the BRAVA heating and cooling units with an air flow increased approximately 30% and a heat output increased of 15% by equipping with the fans with electronically com-mutated ( i.e. regulate or reverse the direction of (an alternating electric current), especially to make it a direct current) motors. Operational noise level – acoustic pressure level when taking into consideration directional coefficient Q=2 and compartment A=100m2 absorption ability.At the distance of 1 metre. All dimensions are stated in mm. 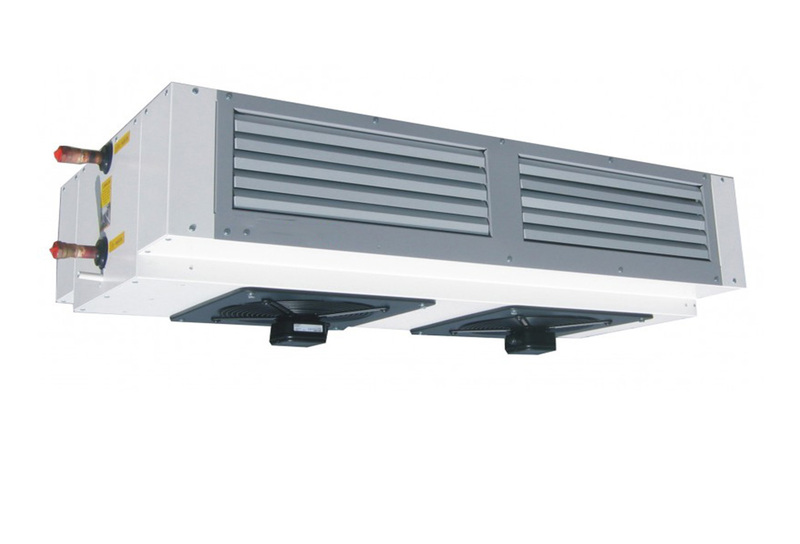 This range is of ceiling mounted units is more industrial / commercial looking in appearance and has been developed to satisfy the larger load requirements of heating and cooling that some buildings require. There are two models withing this range , both require a three phase 400 Volt electrical supply and can be mounted at a maximum height of 4 metres . 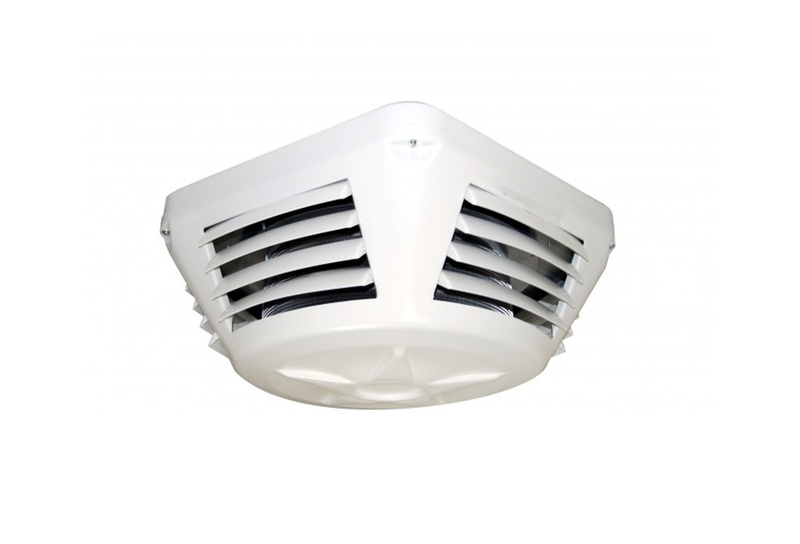 There are two units produces and each one is available with one or two fans installed. Both the Brava 2 , and the FHUGCH range of Heater / Cooler Units can be supplied with a full range of controls that complete the full package. You literally just have to supply the electrical cable and piping to the units , everything else that you would require is included . You could supply or source these additional items required yourself, but we have found that it often works out to be more expensive than purchasing the controls package off us. A room temperature control with RAB3 controller; This controller not only is a room stat,but also has a manual function selection for heating, cooling or ventilation, as well as a manual selectable three step fan speed switch. ZSB Power supply and control box – These are a surface-mounted box, hermetically enclosed (equipped with main switch, over current switches, short-circuit switches, signal lamps) intended for operation and control of the automatic equipment components.All switch gear components are manufactured by leading suppliers of electrical equipment provide the highest reliability. They are incorporated in the box enclosures equipped with a front cover. The actuating levers, adjustment knobs and signaling elements are adjusted from the outside. Internal connections are completely covered and protected to guarantee safe maintenance and normal operation. Other benefits of the Power Supply/Control Box include: large space to accommodate cable and terminals, high safety level, easy operation, servicing and maintenance and operator-friendly design. 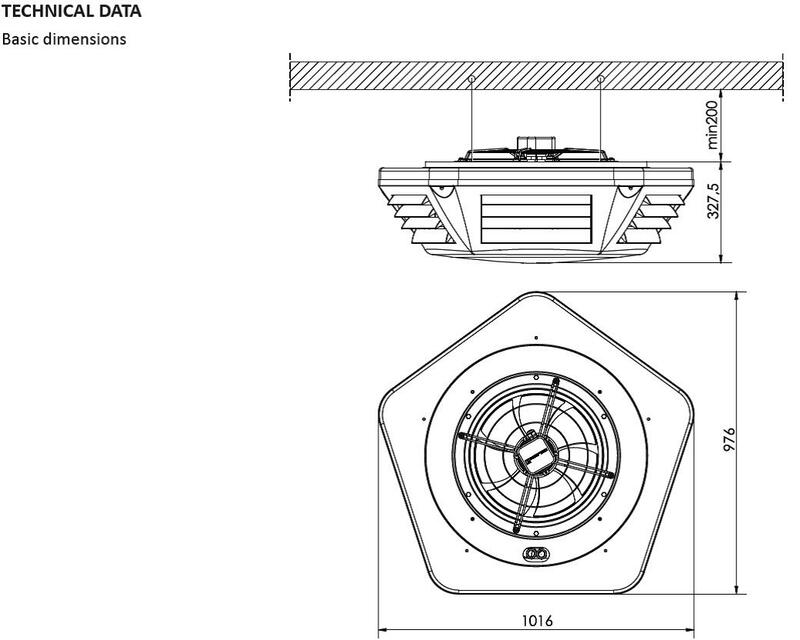 The size of the box depends on the number of connected fans; up to four devices can be connected to a single box. 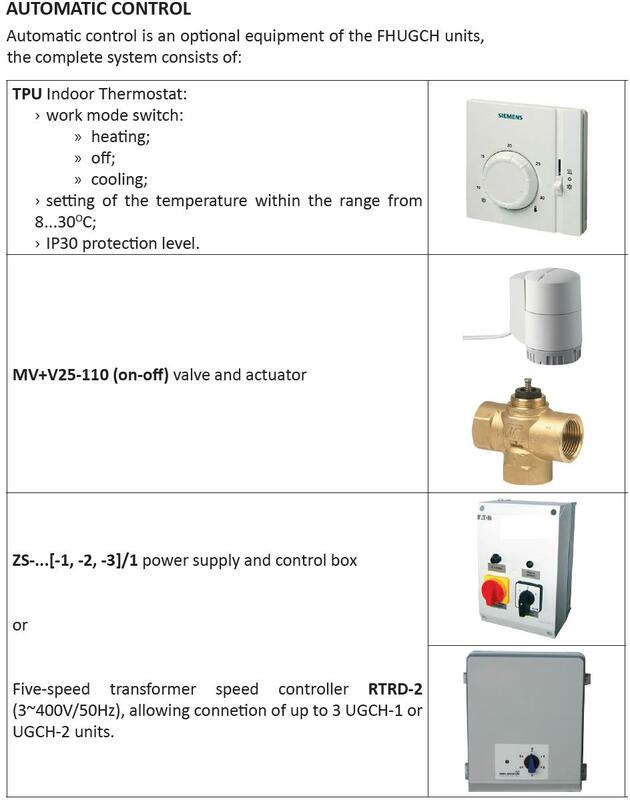 Should you require anymore assistance or information on our Heating and Cooling Systems / Ceiling Mounted Heating and Cooling Units / Heating and Cooling Units , please don’t hesitate to contact our sales team on 01202 822221 or click here for our email contact form.